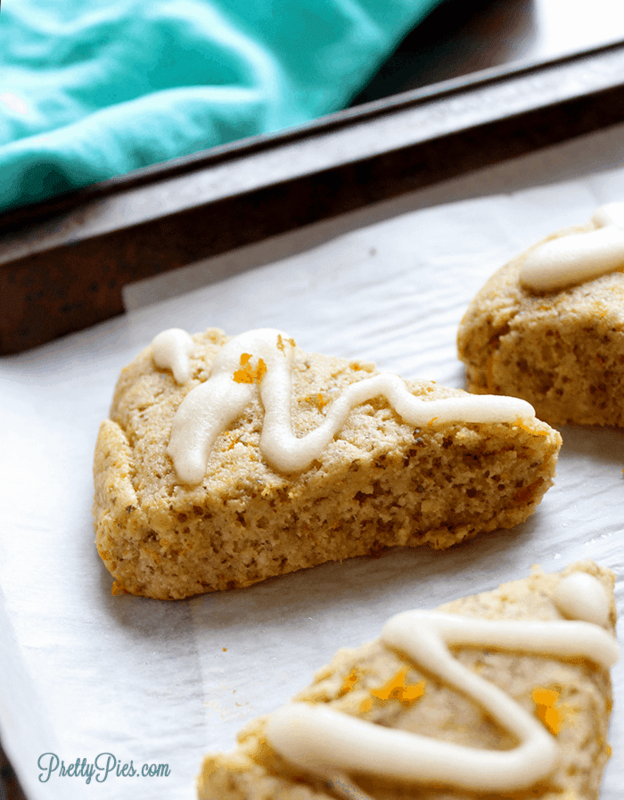 These Orange Scones are crisp on the outside and tender on the inside and full of sweet orange flavor! Free from gluten, dairy, eggs, and sugar for a perfect Paleo, Vegan & Keto friendly breakfast, snack or dessert! My official title, bestowed upon me by my family many years ago, is The Duchess of Scones. There’s a fact you probably didn’t know about me lol! And no, I’m not British, ha. My family has a thing about scones. It started out on a family vacation… maybe 15 years ago when we went to Florida, and there was this quaint little restaurant that served scones. 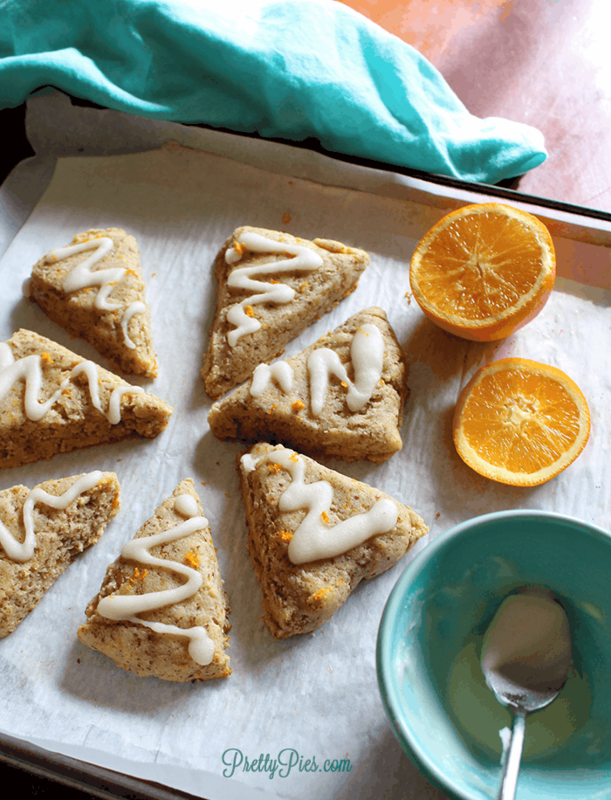 We affectionately named it “Scone City.” They were melt-in-your-mouth DELISH. Since then, we’ve been hooked and we make them at every family gathering. It’s a tradition. Fast forward to the past few years, and now, the ingredients in traditional scones — flour, butter, eggs, cream and sugar: I don’t eat anymore! So needless to say, I miss my dear scones!! I made a declaration at Christmas to do a scone makeover. Using healthy, whole-food ingredients & I DID IT! Do they taste exactly like my dad’s (The KING of Scones) classic butter scones? No. But that’s ok because I still LOVE them. They’re firm and crisp on the outside and tender and soft on the inside. Yum. It’s basically an excuse to eat cookies for breakfast! 😀 And it’s perfectly acceptable. They’re wholesome! Let’s be real. Gluten-Free, Grain-Free, and Egg-Free baking is hard. It’s *not* a simple swap of flours 1:1. It’s a whole other ball game. That’s why I knew I needed the help of an expert. Enter 24 Carrot Kitchen. She’s a Paleo baking QUEEN. 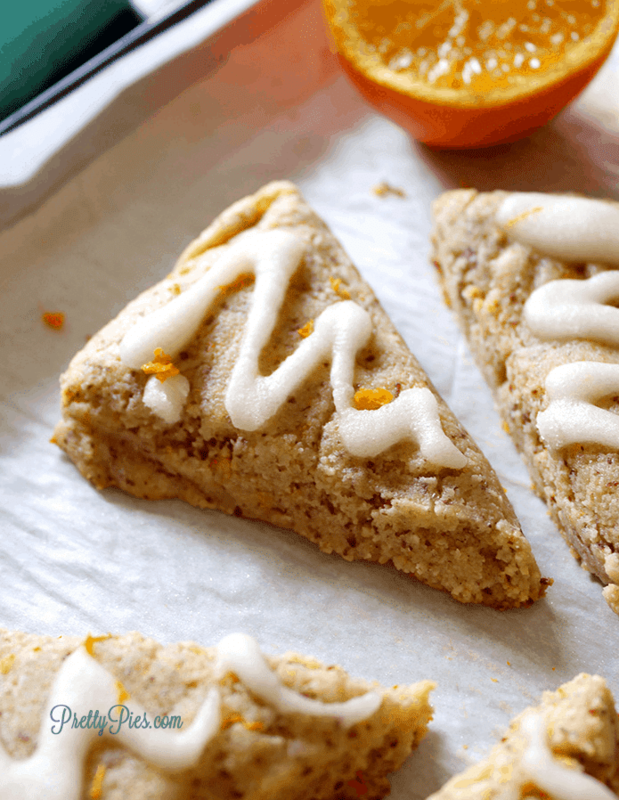 I found her recipe for Cranberry Orange Scones and knew I could tweak it to fit my dietary restrictions. And it worked! Her recipe is FAB, but it does contain quite a bit of carbs (starches), plus eggs and refined sugar. I knew my stomach would not be happy with it. So I worked some magic and made these vegan and keto friendly in addition to Paleo. YAY. If you look closely, you’ll see the little brown flecks inside these scones. That’s the ground flaxseed. It’s used as an egg replacer to hold these scones together. How to make flax egg: Stir together flax and water before mixing anything else. Let it sit for about 5 minutes to thicken. Where to find flax: Ground flaxseed can be found at many grocery stores now. I buy it at Aldi, but I also saw it at Target recently. Tip 1: if you buy ground instead of whole flaxseeds, store it in the freezer so it doesn’t go rancid. Tip 2: Brown flax has a better flavor than golden (it’s more mild). But if you use golden flax, your scones look prettier lol. Your choice. To make them rise without eggs: To ensure these scones didn’t turn into hockey pucks, I added in an extra teaspoon of baking powder for levity. Worked great! These puffed up nicely. ps if you don’t have flax, you can replace the flax egg with a regular egg. THIS is the easy part, thanks to Lakanto Monkfruit! Their sweetners ARE actually a 1:1 swap for sugar and maple syrup. If you don’t have powdered monkfruit, don’t worry because I don’t either! My favorite kitchen hack is to make my OWN powdered sugar. 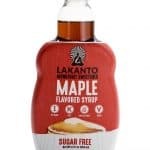 It works with any granulated sweetener including Lakanto classic sweetener. Simply put some monkfruit in a small blender and blitz it for about 10 seconds until it’s all a powder. SO stinkin’ simple! Monkfruit isn’t cheap, but I found a way to get it at a huge discount: Thrive Market! It’s my latest obsession. A destination for healthy foods and so much more. Everything on the site is discounted 20-50% AND they gave me a discount to share with my readers! Use my link here to get an additional 25% off your entire first order. 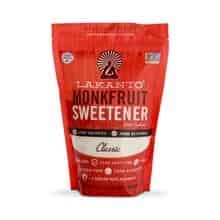 On ThriveMarket.com, Monkfruit Classic is 20% off ($8.79). Add another 25% discount and it’s $6.59! That’s $4 cheaper than Amazon. Dang! I buy all my flours on Thrive Market now: almond, tapioca, coconut. All my sweeteners. All my coconut milk. I love it! You even get to choose a free gift with every order. Last time I got free SIETE (grain-free!) tortilla chips!!! OMG have you tried those yet?! SO dang GOOD. Are you ready to get baking? 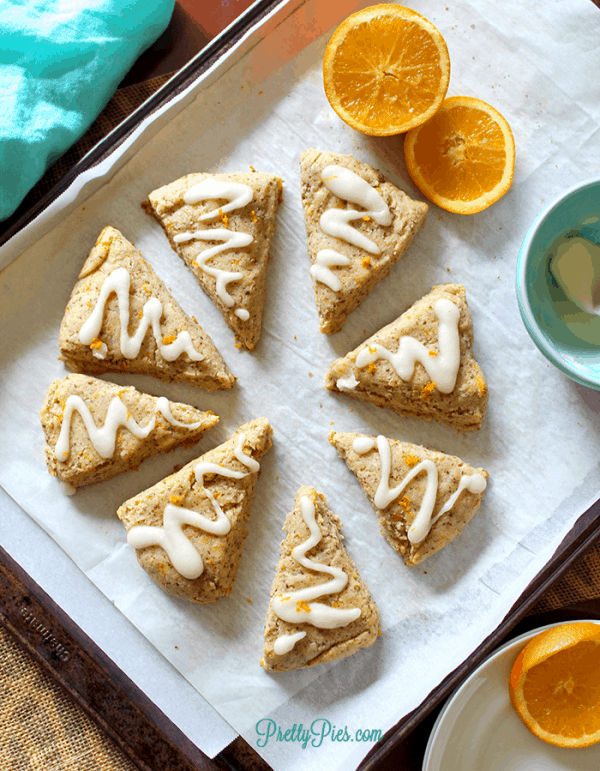 These scones are so easy to make. I even recorded a video about them over on Instagram (saved in my highlights). 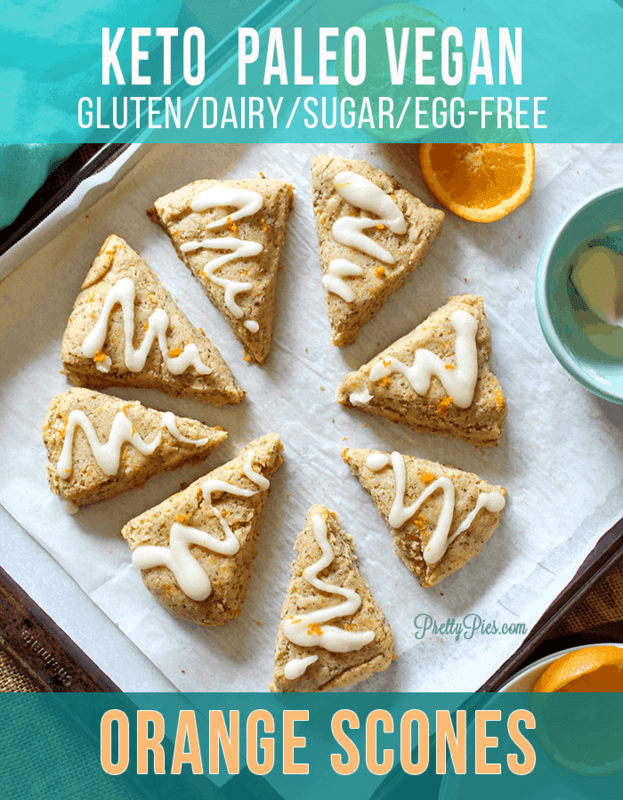 Crisp & tender scones without any gluten, dairy, eggs or sugar! And full of delicious sweet orange flavor. A Paleo/Vegan/Keto friendly breakfast, snack or dessert! Preheat oven to 350. Line a medium baking sheet with parchment paper. In a small dish, stir together flax and water and set aside to thicken. Meanwhile, combine dry ingredients in a medium mixing bowl. Whisk together the wet ingredients in another bowl. Pour wet over dry and mix well. Allow flour to absorb for a few minutes. If too sticky, add about 1 tsp of almond flour at a time until a soft dough forms. If too dry/crumbly, add a splash of water or oj. Place ball of dough on parchment and flatten into a disc about 8" wide and 1" thick. Slice into 8 triangles and separate about 1-2" apart. Bake for about 15 minutes until golden and crisp on the outside. Cool for 5 minutes before adding glaze. Add monkfruit to a small bowl and add 1 tsp freshly squeezed orange juice at time until a pourable consistency is reached. Disclosure: As an Amazon Associate and Lakanto Affiliate I may earn a small commission from qualifying purchases made through referral links in this post (at no additional cost to you). Thank you for supporting Pretty Pies! To store: Scones may be kept at room temp in an airtight container for about 3 days. I store them in a glass container lined with paper towels to absorb excess moisture. Leftovers are best served reheated in a dry skillet for about 5 minutes on medium until they crisp back up. May be refrigerated for about 1 week, or frozen for 1 month (without glaze) tightly wrapped in an airtight container. 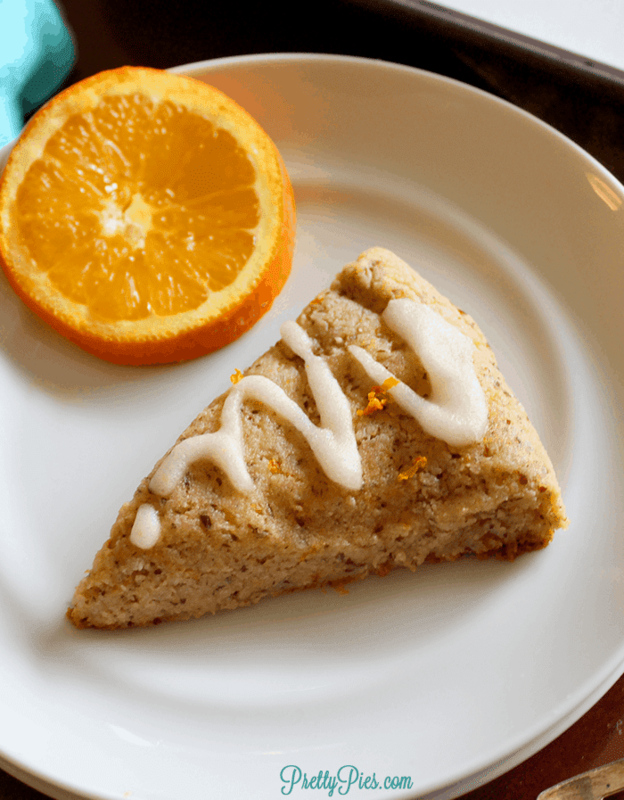 This entry was posted in breakfast and tagged almond flour, baked, breakfast, low carb, monkfruit. 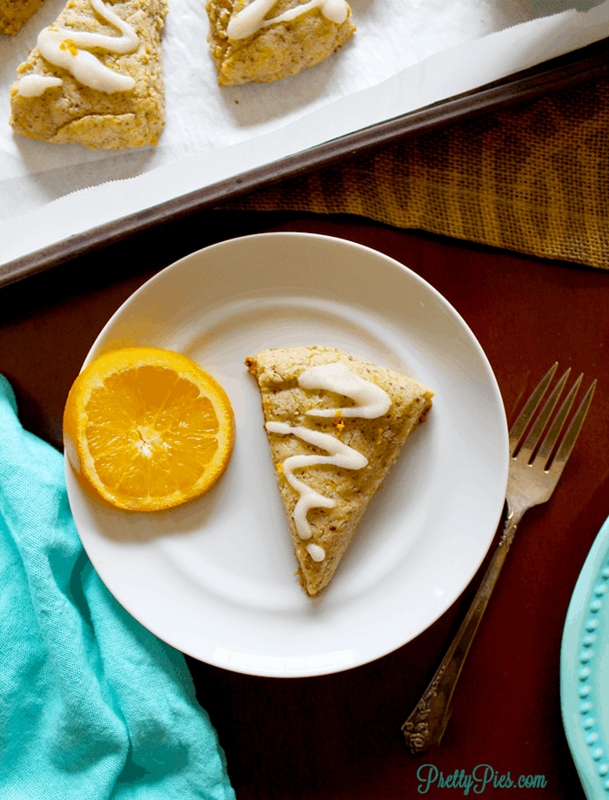 This was my first scone recipe so I don’t have any other flavors– yet! What you could probably do is swap the maple syrup for pumpkin purée, and add ~2-3 Tbs monkfruit granules to sweeten + ~1-2 tsp pumpkin pie spice, to taste 🙂 If you try it, let me know how they turn out! 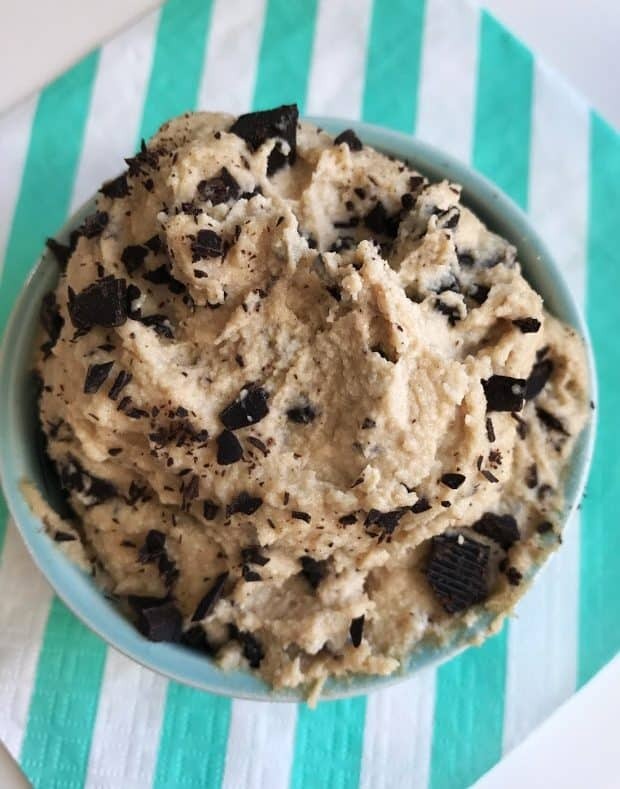 Want my guilt-free dessert eBook? Hi there, I'm Emily! 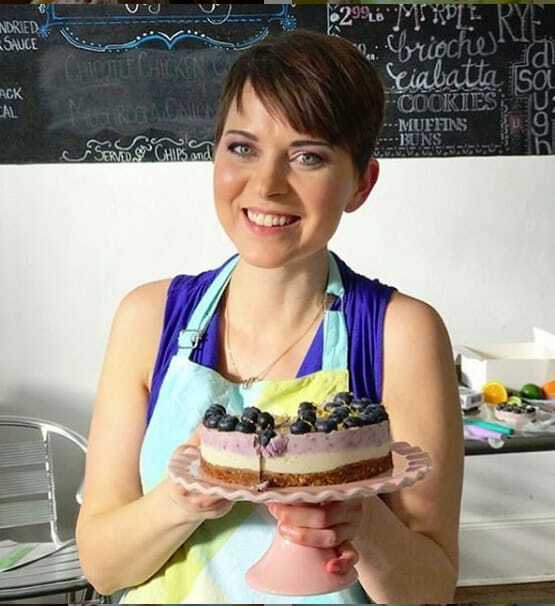 :) I help people create delectable desserts without using dairy, gluten or refined sugar. Pretty food from the inside out!